Beloved of motorcycle couriers everywhere, bike-specific sat navs, like the new TomTom Rider, are fast becoming the bikers' friend. With advanced mapping features, biker-relevant POIs and safety features like advance lane control, bike sat navs could gain car-like adoption as the technology and durability improves. Waterproof to IPX7 standards (which means it can be submerged up to 1m), the Rider has been engineered for the outdoors with a rugged, heavyweight build, plenty of protective outer plastic and rubber screen seals. A clever peak keeps the midday sun off the screen, but otherwise it appears to be a standard TomTom dressed for open air use. At 353g it's reassuringly chunky and measures a fairly standard 130 x 101 x 53mm considering its outdoor protective wrap. It's impressively built for the outdoors, but only time will tell how heavy rain and freezing conditions affect it. It clamps to handlebars with a good-quality, if rather long, vibration-proof system from RAM. The device's touch-screen offers a 480 x 272 resolution across its 11cm width. A key feature is the GUI's compatibility with gloved fingers: a simplified menu keeps button-pressing to a minimum. The bike-specific features are numerous and include some neat touches like a windy route option and a POI system with bikers in mind. Bluetooth connectivity sends navigational instructions to your headset or helmet intercom system and you can even take/make calls en route if you deem it safe to do so. Further key features include advanced lane guidance and TomTom's IQ routes, which collects users' speed data and advises on the quickest course. Battery life is six hours, but the Rider will dock via your bike's charging system giving constant power. A power up/down function responds to the bike's ignition status, too. We occasionally took the road less travelled with the Rider's Winding Routes feature, which can get very windy, but otherwise it's a Ronseal device: right place, best route and on time. The unit's peak enables easy screen reading in bright conditions, but most bikers are likely to rely on the voice navigation; a Bluetooth headset is provided in the advanced Rider Pro variant. Although solid, the clamp elevates the device up high and scooter users, who represent a huge number of new bike sales, would need to check for suitable clamping locations first. The simplified menu is a boon, but touch-screen navigation is still awkward in gloves, beyond the most basic commands. The map services from TomTom are excellent: IQ routes enables you to benefit from the suffering of others, maps for life gives you free mapping (up to four downloads per year) and dynamic daily map changes keep you ahead of roadblocks, temporary speed limits and other fun-prohibiting problems. 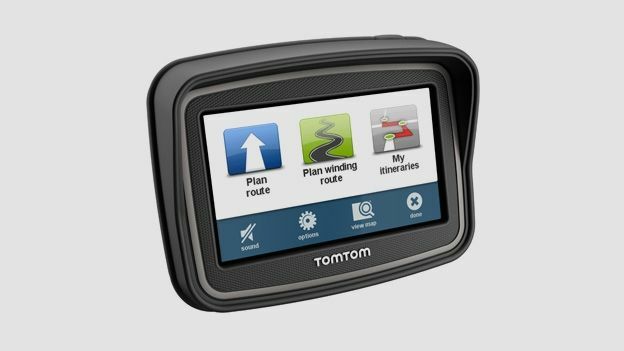 The TomTom Rider is a welcome, feature-packed addition to the bike-specific sat nav arena. Its solid, weather-resistant design and well thought-out features put bikers' needs first, improving safety and enhancing fun. Nice touches put it ahead of rivals from Garmin, but if you want the Bluetooth headset version expect to pay more. Gloved operation wasn't as slick as we'd hoped and a truly bike-specific GUI would make future versions a real knockout.